As at Walmart, Amazon achieves [fast delivery systems] with a regime of workplace pressure, in which targets for the unpacking, movement, and repackaging of goods are relentlessly increased to levels where employees have to struggle to meet their targets and where older and less dextrous employees will begin to fail. . . .
Amazon’s system of employee monitoring is the most oppressive I have ever come across and combines state-of-the-art surveillance technology with the system of “functional foreman,” introduced by [Frederick] Taylor in the workshops of the Pennsylvania machine-tool industry in the 1890s. . . . London Financial Times economics correspondent Sarah O’Connor describes how, at Amazon’s center at Rugeley, England, Amazon tags its employees with personal sat-nav (satellite navigation) computers that tell them the route they must travel to shelve consignments of goods, but also set target times for their warehouse journeys and then measure whether targets are met. All this information is available to management in real time, and if an employee is behind schedule she will receive a text message pointing this out and telling her to reach her targets or suffer the consequences. From the clothes we wear, to the food we eat, to the computers on which we surf the online world, it’s hard to be a moral purist in today’s consumer marketplace. I get that. I also understand that a “rogue” office, factory, or warehouse can pop up in even the best of large companies. Nonetheless, terrible working conditions appear to be baked into Amazon’s current operating mode. Customer convenience and service are important in the retail industries, but they should not come at the expense of employee dignity and well-being. Many years ago, I cut my working teeth in retail stores. When the store floor was busy with customers, or when a shipment of goods had to be unloaded from delivery trucks, we stepped up and got the work done right. When things weren’t as busy, we dialed it down a bit. Overall, people did their jobs steadily and dependably, and we didn’t need to have our every move timed and monitored by managers. We didn’t make a lot of money, but we were treated decently. Amazon, however, regards its warehouse workers as human robots. I’m not suggesting that we completely boycott Amazon. But customer options such as Prime fuel their very worst labor practices. Surely these workers deserve better working conditions, even if it means that we wait, say, three days rather than two for a delivery. I wrote to Amazon explaining my decision and quickly received a reply saying that my concerns would be shared with the appropriate people. I hope this will be the case. For now, Amazon is a 21st century company with 19th century labor practices, and they need to hear from their customers. A new, scientific public opinion survey on workplace bullying in the U.S., conducted by the Workplace Bullying Institute, shows that repeated, abusive conduct remains a significant problem in the American workplace, that employers are doing little to stop it, and that the American public strongly supports workplace anti-bullying legislation. A full 17-page summary of the survey findings is available in pdf format here. Improving on its 2007 and 2010 survey instrument, WBI tweaked its survey to zero in on severe, targeted abuse at work. At first blush, the 27 percent figure of those who have directly experienced workplace bullying may appear lower than previous surveys. In actuality, it reflects sharper questions designed to elicit responses about genuine workplace bullying, while screening out reports of lesser forms of incivility and disrespect. When asked about their understanding of employer reactions to workplace bullying, some 72 percent of survey respondents indicated that employers deny, ignore, or minimize concerns about bullying behaviors — and that some even encourage them as part of competitive organizational cultures. Clearly we need to dig deeper into what employers are doing to prevent and respond to workplace bullying, but the overwhelming public perception is that they’re sweeping it under the rug. The survey questions also more closely track the language and intent of the Healthy Workplace Bill, which provides a legal claim for damages for targets of abusive mistreatment at work and creates legal incentives for employers to act preventively and responsively toward bullying behaviors. In this context, over 9 in 10 respondents supported workplace anti-bullying laws. The long summary is packed with useful, interesting findings. I’ll have more to say about the survey results in future posts. In case you missed them: If you’re looking for fast, accurate, visual explanations of workplace bullying and the anti-bullying Healthy Workplace Bill, here they are. Please share them with others to spread the word about workplace bullying and how we can address it. I worked closely with the APA in developing the script for the video, and I’m delighted with the final result. Deb did a fantastic job of boiling down the need for this legislation and the substance of the bill itself into readily understandable basics. My connection to this august group came about from an article I wrote over a decade ago. In a 2002 law review article, “The Employment Law Rights of Student Interns” (Connecticut Law Review), I set out a legal framework arguing that many unpaid internships violated minimum wage laws. Frankly, it didn’t cause much of a stir. Rather, over the years it attracted a handful of citations in other law review articles, and this was pretty much about it. That changed when writer Ross Perlin cited and touted the article in his seminal book, Intern Nation (2011; 2012 updated p.b. edition), the first comprehensive examination of the social, economic, and legal implications of the burgeoning intern economy. 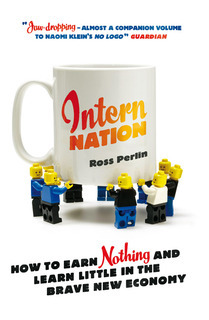 Ross was the first writer to connect all the dots on the intern economy. I regard his book as the bible of a new movement. It’s quite possible that none of this would’ve happened had he not written it. Among the early readers of Intern Nation was Eric Glatt, an MBA holder and former unpaid accounting department intern for the Fox Searchlight Pictures production of the movie “Black Swan.” Eric spied the references to my law review article, and after reading it he came away with ideas for a lawsuit seeking back wages from Fox. He sought a law firm to explore this possibility, and he found one of the very best in Outten & Golden, a leading plaintiffs’ employment firm in New York City. They decided to file suit, and Rachel Bien, a partner at the firm, would serve as lead counsel. The lawsuit prompted some media coverage when it was filed, and then the story exploded when, last June, a New York federal district court judge ruled that Glatt and co-plaintiff Alex Footman were entitled to back pay under state and federal minimum wage laws and certified the case as a class action for other Fox interns. Rachel and Eric are now planning for the case to be heard by the U.S. Court of Appeals. As the lawsuit against Fox was percolating, Glatt and others were busy organizing in New York. Out of the Occupy Wall Street movement came a working group that evolved into Intern Labor Rights. ILR has become the “go-to” informational and organizational presence on challenging unpaid internships. More than any other group, ILR is responsible for branding this as a movement now properly “owned” by a younger generation of activists who are putting their own stamp on it via creative social media outreach, organizing, and advocacy. 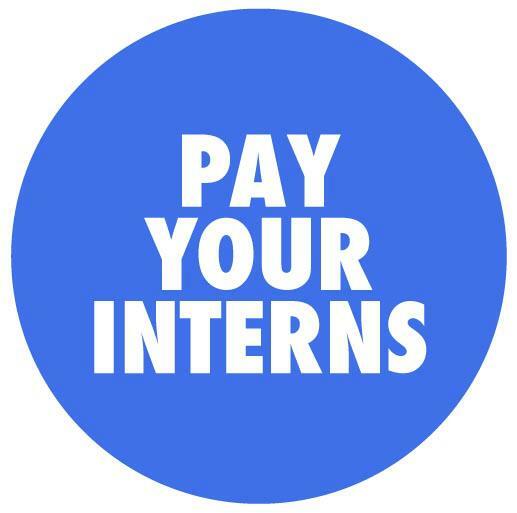 Many more lawsuits challenging unpaid internships have been filed. Some have settled; others are pending. The intern rights movement has hit the court dockets. Go here for a comprehensive report by Intern Labor Rights documenting the extraordinary developments of 2013. Go here for ProPublica’s wide-ranging investigative project on the intern economy. Go here for an in-depth Boston Globe Sunday magazine cover story on unpaid internships by Melissa Schorr. 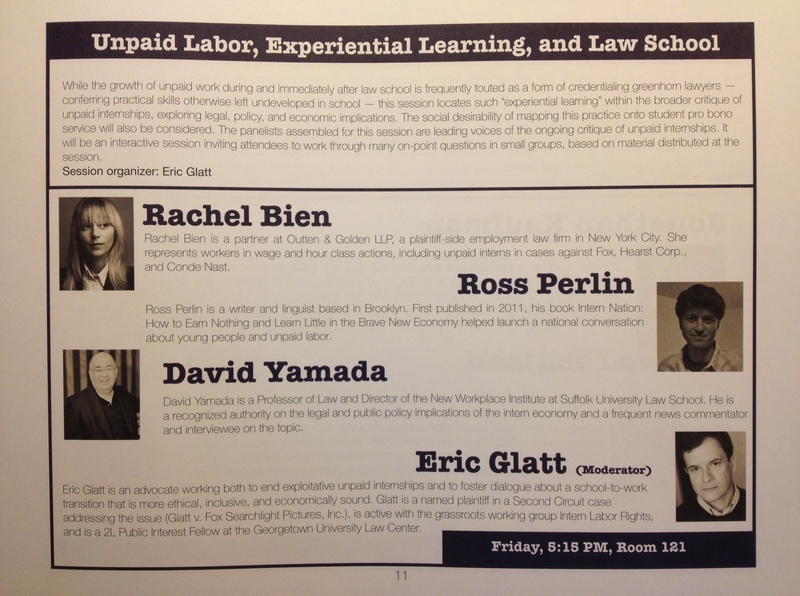 The discussion about unpaid internships at the Yale conference quickly evolved into a broader examination of social, economic, and political ramifications concerning students, recent graduates, and work, especially as it pertains to law students and new lawyers who want to do public interest work. There’s a particular dilemma here for those who want to extend legal services to the poor, while not wanting to deprive law students and lawyers from compensation for their work, especially during rough economic times for the legal profession. Because most of the unpaid intern litigation has focused on for-profit corporations, the applications of wage & hour laws to the non-profit sector are unsettled. In a nutshell, federal minimum wage laws do not exempt non-profit employers, but they also allow for taking on volunteers. Hence, there’s a massive gray area for legal pro bono work. In addition, the dialogue explored the implications of the intern economy for work in general. What happens when young people get caught in a cycle of constant unpaid “opportunities,” with no paying work on the horizon? Indeed, the narrower focus on internships per se is giving way to a broader inquiry about employment, jobs, and the labor market in the midst of the meltdown economy, as it should. Please forgive a brief nod to my Cancerian nostalgic side, but at the conference I couldn’t help but reflect upon a December 2011 meeting with Eric, Ross, and journalist Tiffany Ap at my favorite Manhattan diner. Ross’s book had been published earlier that year, and Eric had filed his lawsuit in September. As you can read from the tone of my write-up on our get together, we had very little idea of what was to come. Since then, it has been my pleasure to serve in a background, resource role to this growing movement. As I suggested above, it is now the province of a younger generation. I’m happy to say that there’s more to come. You may go here for my 2002 law review article (Connecticut Law Review) on internships and go here for my forthcoming 2014 law review article (Northeastern University Law Journal) discussing legal and policy developments of the past three years. The Temple Political & Civil Rights Law Review has just published my article, “Emerging American Legal Responses to Workplace Bullying,” that emerged from the February 2013 symposium on bullying across the lifespan at Temple University’s law school. The piece provides a short update of legal and policy developments concerning workplace bullying and includes the current template version of the Healthy Workplace Bill. I had posted a draft last year; this is the final published version. Although the complete collection of articles from the symposium is not yet available online, you can access Prof. Nancy Knauer’s (Temple U.) overview of the symposium issue here. And for my write-up of the Temple conference, go here. For readers who would like more in-depth explorations of the legal issues concerning workplace bullying and related topics in the U.S., here are links to, and brief summaries of, relevant journal articles I’ve written over the years. Each may be accessed without charge from my Social Science Research Network page. While these articles are published in academic journals, they nevertheless have attracted many readers who are not lawyers or law professors. The Phenomenon of “Workplace Bullying” and the Need for Status-Blind Hostile Work Environment Protection — Georgetown Law Journal, 2000 — This is the first in-depth examination of the American legal and policy implications of workplace bullying. Considered a groundbreaking piece. Crafting a Legislative Response to Workplace Bullying — Employee Rights and Employment Policy Journal, 2004 — This contains and explains the first version of the Healthy Workplace Bill, as well as brief discussions of early legislative and regulatory responses to workplace bullying in other nations. Workplace Bullying and American Employment Law: A Ten-Year Progress Report and Assessment — Comparative Labor Law & Policy Journal, 2010 — This piece is part of a collection of articles looking at enacted and proposed legal responses to workplace bullying on an international scale. It contains an updated version of the Healthy Workplace Bill. Workplace Bullying and Ethical Leadership — Journal of Values-Based Leadership, 2008 — This article provides a general overview of workplace bullying and its implications for organizational leadership. Human Dignity and American Employment Law — University of Richmond Law Review, 2009 — I pulled in a lot of historical and theoretical sources in an attempt to construct a case for making human dignity the primary framework for evaluating and shaping U.S. employment law. Employment Law as If People Mattered: Bringing Therapeutic Jurisprudence into the Workplace, Florida Coastal Law Review, 2010 — This article places employment law issues (including workplace bullying) in the context of therapeutic jurisprudence, the school of legal thought that examines the therapeutic and anti-therapeutic properties of our laws and legal systems. Periodically I get e-mails and voice mails from people who would like to get involved in addressing bullying at work. More often than not, they have experienced or witnessed workplace bullying firsthand, and now they’d like to do something on a broader scale to prevent bullying and help others who have been targeted. Here are my thoughts on this topic. 1. Do you have specific training, work experience, or licensure that provides opportunities to address workplace bullying? If so, you may be able to contribute your specific expertise to this movement. 2. Do you have a personal or professional network that you can influence or tap into? Your networks may be a potential audience for your efforts. 3. Are you ready to learn about workplace bullying beyond your immediate familiarity? Personal experience can be a great teacher, and most people who are active in this movement have been bullying targets, have witnessed others being bullied, or have been close to someone who was bullied. But workplace bullying is a topic with complexities that go well beyond one person’s experience. The more you know, the more effective you’ll be as a change agent. 4. Especially if you’ve experienced workplace bullying, are you ready and able to become involved in a movement that may cause you to revisit some of those bad experiences? Admitting that you’re not ready to become active in these efforts is a sign of self-honesty and strength, not personal weakness. For some people, getting active in this movement is an affirming activity. For others, it is too unpleasant a reminder of what they went through, and they owe no apologies for that. Take care of yourself first, and make a decision accordingly. Support the anti-bullying Healthy Workplace Bill. Go here to identify ways to be part of the advocacy campaign. If you feel secure in doing so, encourage your employer to develop anti-bullying policies, procedures, and training programs. In this context there is strength in numbers, as the University of Massachusetts workplace anti-bullying campaign illustrates. Speak out. Post about workplace bullying on social media. When articles about workplace bullying appear online, post comments that reinforce the importance of stopping bullying at work, taking on Internet “trolls” who deny that bullying is a serious problem in our workplaces. Help create a chorus of voices who proclaim that workplace bullying is inexcusable behavior. If you’re in a union, get them on board with this. ‘Nuff said. Go here for a sampling of what unions can do to put an end to workplace bullying. Encourage civic or professional groups in which you are active to support the workplace anti-bullying movement. Organizations associated with specific professions or vocations are especially good possibilities. If you are in a position to do so, provide financial support for workplace anti-bullying initiatives. Play an active role in efforts to prevent and respond to bullying behaviors across the lifespan, including in schools and senior facilities, in addition to the workplace. After all, bullying does not start and end in one setting. If you want a great example of a super activist concerning workplace bullying, then take a look at the work of Drew Mitchell, who hosts a Stop Workplace Bullies Now! Facebook page and website. Drew has created an important role for himself as a writer and connector in this movement. I’m sure I’ve omitted other viable possibilities, and I’m happy to take your suggestions in the comments. High quality organizations aren’t afraid to reach out for help when the need arises. This may include retaining a consultant with special expertise to address a specific situation or challenge. Low quality organizations, however, seem to retain consultants for just about everything. Senior managers who lack the knowledge to guide their organizations or the courage to own tough decisions often hire consultants to do the work for them. When difficult actions are necessary, these managers are quick to hide behind a consultant’s recommendations. The outsourcing of leadership suggests that the skill sets and personal characteristics of senior managers are deficient, but rare is the consultant who will be in a position to say that. Instead, the consultant may be more like an advisor to a ship’s captain who can’t decide how to allocate seats in the lifeboats after ramming the boat into the iceberg. In cases where top managers are willing to invest time, energy, and accountability into changing their ways for the better, executive coaching may be a viable option. In his book Energy Leadership: Transforming Your Workplace and Your Life from the Core (2008), coach and therapist Bruce Schneider presents a case study of how he coached a company president who realized that he had to change in order to bring out the best in his employees. Schneider details how this executive transformed himself, and in the process reversed the fortunes of his fading company, while managing to retain most of his workers and inspiring them to change their attitudes as well. The choices start at the top. Smart, bold choices may result in positive change. Hiring layers of consultants to do the heavy lifting may have an opposite result, or at best maintain a dysfunctional status quo.